My roots (heritage) are Jamaican (mother, father, maternal and paternal grandmothers, paternal grandfather), Cuban (maternal grandfather), West African (maternal great-grandmother), Jewish (maternal great-grandfather), and Indian (paternal great-grandmother). This is as far back as I can trace my family tree. My other roots (hair) are thick and curly. I used to consider my hair unruly and begged for a relaxer at age 12. My aunts, with their bone-straight tresses, took my side and my mother caved. I wish she hadn't because this was the beginning of a 17-year sentence, during which I was a prisoner to the beautician's chair, the latest hair care products, and the weather (can't get your touch-up wet!). All this (plus thousands of dollars) in the name of achieving "good hair" status. In 2005, I finally decided enough was enough. I set myself free by growing out my processed hair and going natural. That was me taking ownership of my beauty and vowing never to allow someone else to define it for me, ever again. I know my daughter is going to have similar conflicted feelings about her hair. At just three months old, the texture of her hair receives much more attention from family members than her latest developmental milestone. But I am equipped to handle their comments and her inevitable questions about whether she has "pretty" hair or when can she get a permanent. My answers are simple: "yes, your hair is beautiful because no one else has hair like yours" and "no, you won't be getting any chemical hair processes while you are still a child living under my roof." I will teach her to look past society's standards and see the beauty in the crown that God bestowed upon her head. I will honestly share my own struggle to love the hair on my head and hope she will appreciate her own and choose never to chemically change it. You see that girl in the two-piece bathing suit? 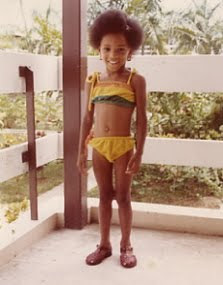 Yep, that's me at age 3, all set to go to the beach in Negril. Little did I know that 30 years later, I'd be sporting the same hairstyle. Look at you all kneecaps and hair! Too cute. I think au natural is always more beautiful. Maybe it's the white girl in me, but I never did understand why Brown women (I don't want to use African American because you are more than that!) did such crazy things to their hair. I LOVE 'fros, I love their unruliness, I love the curls. :) Sport it, woman, and enjoy! I think it is kinda funny how people with straight hair (to include myself) want to curl their hair or get perms to make it curly and people with curly hair always want it straightened. In my opinion, I love all styles and types of hair and do styles that cross different ethnic heritages. I love the creativity in them all. BTW you were an a very cute little girl :) Have a wonderful day! Hello! Sherry & I work together and she was showing me a few pix of your daughter on your blog site. She is so beautiful ;-) Have a great weekend! This makes me so happy. I'm a hairdresser and relaxers and perms are hair torture, and scalp torture too, especially for a little girl. You are wonderful mother! The whole "pretty hair" thing used to send me into the highest levels of "pisstivity" until I embraced the reality that, as their mom, I had a front row seat in the influence arena where my girls are concerned. Marley and Sage have two different hair textures, and they both have locs. I still get the "how come her hair is so soft" comments regarding Sage, and I use it as an opportunity to educate people on appropriate and inappropriate statements IF my children are within ear shot. I tell my girls each day how beautiful their hair (and the rest of them, for that matter) is, and always will be because God decided that long before they got here! (Sorry for the rant!!). I'm ethnically what we call a callaloo - all kindsa mixed up! I don't think I've ever seen my mom's hair not straightened but I used to have stick straight hair that has developed a curl of its own over the years. When it was straight, I'd do anything to get some kind of curl in it, and now I go to the hairdresser every few weeks to have it blown straight. Thursdays with Teresha: Welcome to the Nut House!